The Italians supplanted the Ottoman Turks in the area around Tripoli in 1911 and did not relinquish their hold until 1943 when defeated in World War II. Libya then passed to UN administration and achieved independence in 1951. Following a 1969 military coup, Col. Muammar Abu Minyar al-QADHAFI began to espouse his own political system, the Third Universal Theory. The system is a combination of socialism and Islam derived in part from tribal practices and is supposed to be implemented by the Libyan people themselves in a unique form of "direct democracy." QADHAFI has always seen himself as a revolutionary and visionary leader. He used oil funds during the 1970s and 1980s to promote his ideology outside Libya, supporting subversives and terrorists abroad to hasten the end of Marxism and capitalism. In addition, beginning in 1973, he engaged in military operations in northern Chad's Aozou Strip - to gain access to minerals and to use as a base of influence in Chadian politics - but was forced to retreat in 1987. UN sanctions in 1992 isolated QADHAFI politically following the downing of Pan AM Flight 103 over Lockerbie, Scotland. During the 1990s, QADHAFI began to rebuild his relationships with Europe. UN sanctions were suspended in April 1999 and finally lifted in September 2003 after Libya accepted responsibility for the Lockerbie bombing. In December 2003, Libya announced that it had agreed to reveal and end its programs to develop weapons of mass destruction and to renounce terrorism. QADHAFI has made significant strides in normalizing relations with Western nations since then. He has received various Western European leaders as well as many working-level and commercial delegations, and made his first trip to Western Europe in 15 years when he traveled to Brussels in April 2004. The US rescinded Libya's designation as a state sponsor of terrorism in June 2006. In January 2008, Libya assumed a nonpermanent seat on the UN Security Council for the 2008-09 term. In August 2008, the US and Libya signed a bilateral comprehensive claims settlement agreement to compensate claimants in both countries who allege injury or death at the hands of the other country, including the Lockerbie bombing, the LaBelle disco bombing, and the UTA 772 bombing. In October 2008, the US Government received $1.5 billion pursuant to the agreement to distribute to US national claimants, and as a result effectively normalized its bilateral relationship with Libya. The two countries then exchanged ambassadors for the first time since 1973 in January 2009. For silver and base metal coins of the Libya, please look at our original Chard Coins website. 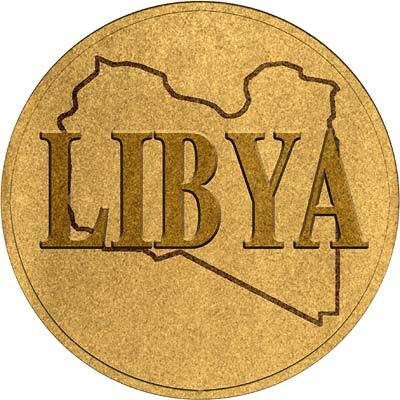 We make an active market in almost all world coins, gold or otherwise, including Libyan gold coins. If you have any of these coins to sell, please contact us, or post them to us for appraisal and offer.